3D printing has in many ways helped people and the development in various areas. From the implementation in different education systems to how it has helped in developing the medical sector. 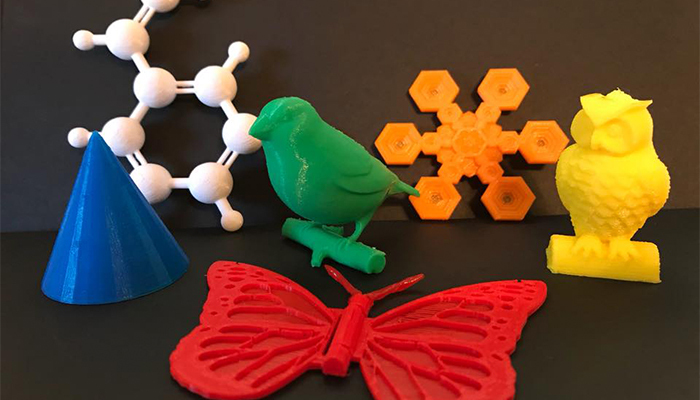 One organisation that has found a way to help people directly through 3D printing is See3D. Based on the fact that blind people don’t get the opportunity to see things in the traditional way. This organisation uses the 3D technology to help the blind see various things by 3D printing them. Working on a voluntary and donate based platform. Its sole purpose; Bring people across all backgrounds closer together. Along with helping blind get a better understanding of what many of us take for granted. We got to talk with the young founder, Caroline Karbowski, to learn more about the initiative. Caroline holds a snowflake (corner_case), and a butterfly (mathgrrl). On the table are models of a house (Nick S./See3D), pyramid (bbennington), Abraham Lincoln bust (TheNewHobbyist), Washington Monument (adams00), castle (gluetolf), chloroplast (xILx), DNA (mtdna), and dog (MustangDave). However, I didn’t know anyone who was blind who wanted a model, and I didn’t have access to a 3D printer. In high school, we had 3D printers. I realized that many people wanted to print objects because the printers were so fascinating, but they were not sure what to print. We also had a lot of leftover filament from student projects. 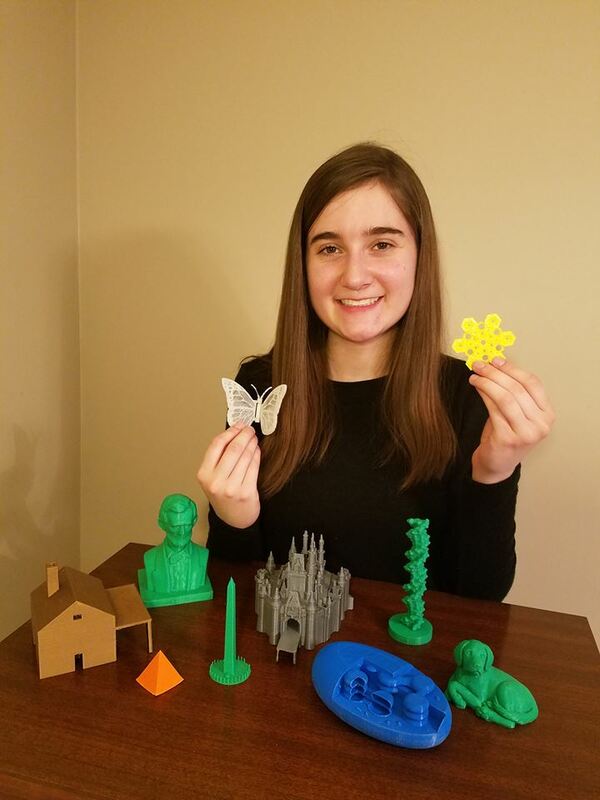 I thought, “What if we printed models for people who are blind?” and decided to make that the basis for a project to present at TechOlympics, a student-run technology conference in Cincinnati for high school students ( https://techolympics.org/ ). I worked with my friends at school to make a website, where we could take requests for models to print. I then met Cassandra, who is blind, at a college fair and asked her what she would like to better understand. She asked for a Cinderella castle, so that was the first model we printed. 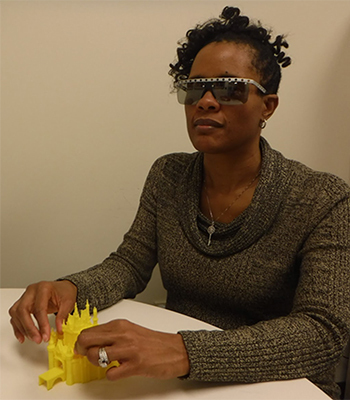 Cassandra shared See3D with some of her friends who are blind, and from there we have distributed over 500 models in the past two years, and are connecting with more people every day. Anyone who is blind, or a teacher/parent/friend of someone who is blind, can make a request for a model on our website. We then print and mail the model to the recipient. We also invite anyone who has had experience in 3D printing, or has an interest in helping to design and print models for See3D to contact us at [email protected]. See3D also helps raise awareness about the importance of braille literacy, orientation and mobility training. As well as having high expectations for those who are blind, because low expectations create obstacles between people who are blind and their goals for success. 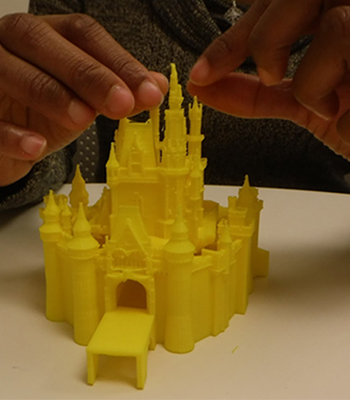 Cassandra examines a 3D print of a yellow Cinderella castle. Yellow Cinderella castle designed by gluetolf. 3DN: Do you have any special projects you are focusing on at the moment? Currently, we are working on making our website and online requesting system more accessible. We’re planning to add resources for learning braille, and how to print and design models that are appealing to the touch. A Teacher of the Visually Impaired (TVI) who is blind, recently contacted us. He was interested in having his students print models for other students who are blind. So I am very excited about this opportunity. We are also looking at raising funds to purchase 3D printers to give to schools with students who are blind, so they do not have to wait for models. Some requests that came in this week were for a model of an eye, street maps, and a Yin Yang. Which we have been working on printing and mailing. I am also looking for students at my college, The Ohio State University, to help design, print, clean, and mail models. 3DN: Where do you see See3D in the future? I would like to see the scale of our outreach increase. Since it can take between 1-5 weeks to print and distribute models. I hope to connect with more volunteers to help print. And further for See3D to provide printers to schools with students who are blind. It would also be amazing to have a network of people who would like to design new objects that have been requested. I would like to bring See3D into 3D printing design classes. So students could design objects that have been requested for their assignments. Some objects that have been requested, that we haven’t been able to successfully print are: fire, sound waves and a roller coaster. It would be great to have these models available. Currently, we have been able to provide models free of charge from the money raised by our GoFundMe page. I hope See3D can continue to be self-funded through grants and donations, so we can continue to provide this service. It would also be great to have a program where businesses or individuals could sponsor a 3D printer for a school. We hope to develop relationships with 3D printing companies to encourage them to make their printers and slicing programs accessible via screen readers and braille displays. So people who are blind can design and print models. I hope for See3D to raise awareness about blindness and the need for accessible materials. Less than 10% of students who are blind are taught braille. So I hope as more people hear about the importance of braille in education, more students who are blind gets the opportunity to learn it. I hope See3D can continue to connect people who are blind and sighted, so everyone can gain a new perspective of the world. It is so important to have 3D models that accurately represent the object, so the model can be used in an educational setting. Just as if a picture was drawn incorrectly, a 3D model should also be accurate. Blindness is also not a characteristic that defines someone. With accessible materials such as, braille, tactile graphics, screen readers, and 3D printed models, everyone can reach their full potential. I really want to encourage others to meet someone who is blind, and ask them how they interpret the world. One of my friends who are blind described the color orange as cold, because oranges from the fridge are cold. There is so much we could learn from using all of our senses. I am excited to see what all the people might discover when they touch a 3D printed model. What do you think of See3D and their initiative, would you lend a helping hand? Let us know what you think in a comment below or on our Facebook and Twitter pages! Don’t forget to sign up for our free weekly Newsletter, with all the latest news in 3D printing delivered straight to your inbox!